Deborah Lira and her husband are first in the ticket line. You can stand or sit in line but no blocking businesses or the sidewalk. 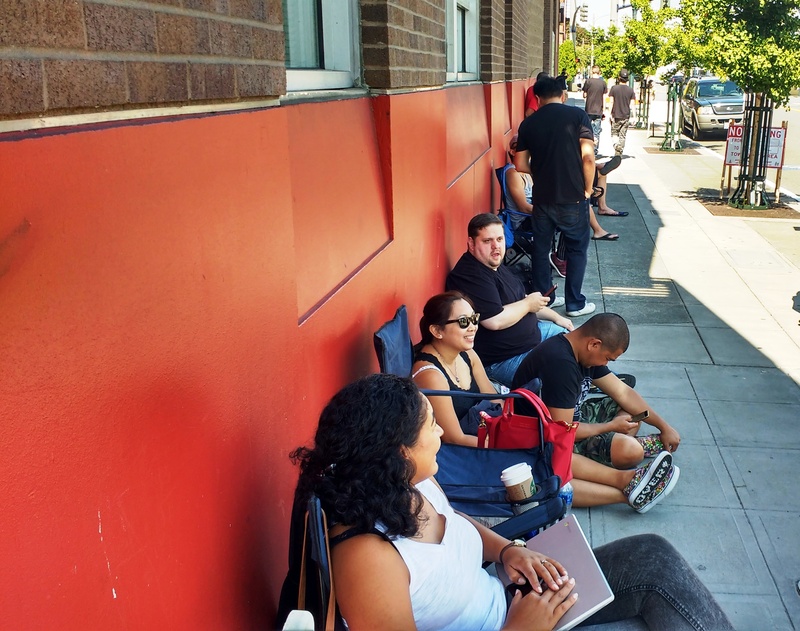 There are people from Japan, people from Brazil and from various parts of the United States in line for tickets to tour the new 17,000 square foot retail space at the Funko HQ in the former Bon Marche building in downtown Everett.Deborah Lira has the first spot in the official ticket line. She and her husband drove up from Berkeley, CA on Tuesday. “I can’t even tell you how many collectibles I have,” said Lira. MyEverettNews.com confirmed with Everett Police that people will be allowed to stand in line overnight for their chance to get tickets. 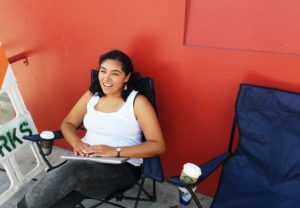 The line started at the corner of the Everett Performing Arts Center in the 2700 block of Wetmore and stretches north from there. People will not be allowed to block the sidewalk or any driveways or entrances to businesses. Ticket distribution begins at 7:00 AM Saturday. The Grand Opening begins at 9:30 AM with the first tours starting at 10:00 AM. They hope to get about 100 people through each hour. It will be best to travel light as bags and backpacks will not be allowed inside the store. 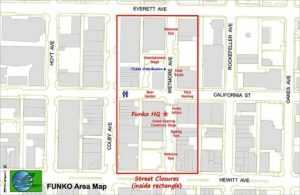 A check with area hotels shows most are sold out and many of those reservations have been made by people coming to Funko. 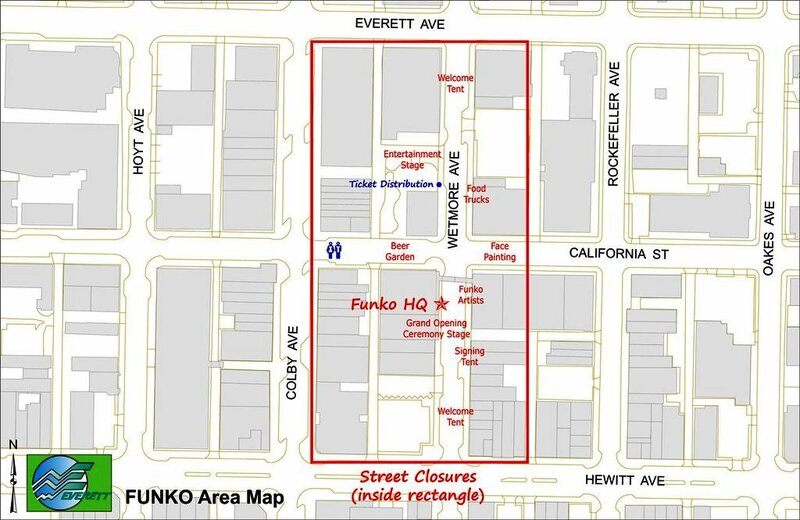 Here’s a layout of the FUNKO Grand Opening. Click to enlarge. The 17,000 square foot retail space on the first floor has been customized in true Funko fashion and features immersive worlds inspired by Marvel, DC Comics, Star Wars, Harry Potter and more, allowing guests to explore massive displays featuring new products, exclusive items and giant Funko figures. The jumbo-sized figures will tower over visitors – some over 10 feet high – and create the perfect Instagram moment for pop culture fans visiting downtown Everett. Additionally, the Funko HQ store will feature a newly designed “Pop! Factory”, which will enable visitors to build their own custom Pop! vinyl figure, as well as “Funko University”, an area of the store dedicated to teaching and mentoring young students in the skills of drawing, sculpting and toy design. Funko NYCC 2017 Exclusives: 80s & 90s!